As a young reporter I visited West Berlin several times in the mid-1980s, and on one of those visits I traveled to East Berlin, where I met Christof Theilemann, an East German theological student. Due to his affiliation with the Protestant church, he had had the rarest of all opportunities for a citizen of the German Democratic Republic (GDR): He had been granted an exit visa to travel to Britain to study, although his wife, Dagmar, and young child had not been permitted to join him. As a result, he spoke English fluently. We became friends, and since I could go in and out of East Berlin but they could not leave, I saw them only in the GDR. Armed with my American passport, I would cross into East Berlin via the U-Bahn, one of the city’s two prewar subway systems. The underground system—made up of the U-Bahn and S-Bahn—was split in two when the East German government constructed the Berlin Wall in 1961, but in one of the endlessly fascinating vagaries of Cold War history, trains still ran through tunnels that traversed the border. It was always surreal to look out the window as the train traveled through empty platforms of what were known as ghost stations. The U-Bahn was the main way for people traveling from West Berlin to see family members or friends to reach East Berlin. And so I would get on the train in West Berlin and disembark at Friedrichstrasse station, which, although on GDR territory, continued to be a hub for the U-Bahn, S-Bahn and long-distance trains. Once my papers were carefully gone over by stern GDR border guards, I’d walk through East Berlin’s sad, gray streets to Christof and Dagmar’s small apartment. Moment editor Nadine Epstein with Christof and Dagmar and their daughter. It was located in a church-owned building next to a bullet-pocked seminary on Borsigstrasse. We never spent much time at the apartment because, as active church members, they were certain it was bugged. Instead, we walked around oddly silent East Berlin, quietly discussing the unfairness of it all. That they were closed off from the world horrified me. I recall giving Christof and Dagmar jeans and cassette tapes (yes, remember them?) and books. The last time I visited—in 1988—Christof handed me an early hardcover edition of Baudelaire’s Les Fleurs du Mal in French. There were few consumer goods, but antique Western classics, he explained, were plentiful. The leaving was always the same. Christof would walk me back to the Freidrichstrasse station, then known as Tränenpalast or “Palace of Tears,” since so many goodbyes were said there. I recall the last time we said goodbye—it was 27 years ago, and I remember it all so clearly. The horror of knowing I could leave and Christof and his family could not. I felt angry, guilty, helpless. We had no idea that in a year or so the wall would come down. In the first years after the wall fell, Christof wrote me long letters, which I still have. These old-fashioned missives, written in ink on crisp, thin airmail paper, told the story of what happened and how he felt. He and Dagmar and their children did not climb atop the wall the first day, but waited until the next, lining up at the Freidrichstrasse station to take the U-Bahn across the border. I lived the miracle of those days through Christof’s letters. And although I thought about Berlin often, life led me in other directions, and I didn’t return to see the changes myself. Eventually, caught up in our own lives, we stopped writing. With the onset of the Internet, I haven’t had any similar long correspondence since. This month, I returned to Berlin for the first time since 1988. Before I left, I did a Web search for Christof, and within seconds I had his email address. My first night in the city, still having barely absorbed its transformation, I met him and Dagmar and their youngest child at a French bistro next to my mod hotel on the banks of the Spree River in the old city center, once cut off in the GDR but now again full of life. We had a lovely cosmopolitan dinner with abundant food and wine, and we caught up. Christof, who is also fluent in French, had quickly become an inveterate traveler. He works in the “foreign office” of The Evangelical Church of Anhalt as deputy theological director, tending its links with the U.S., Western Europe and East Asia. Having lived all of her formative years behind the wall, it had been harder for Dagmar to adjust at first. But after 26 years she has grown more accustomed to travel, and teaches religious studies at a primary school. They are renovating their apartment, and they vacation in France. Their three older children are living in various far-flung corners of the world. 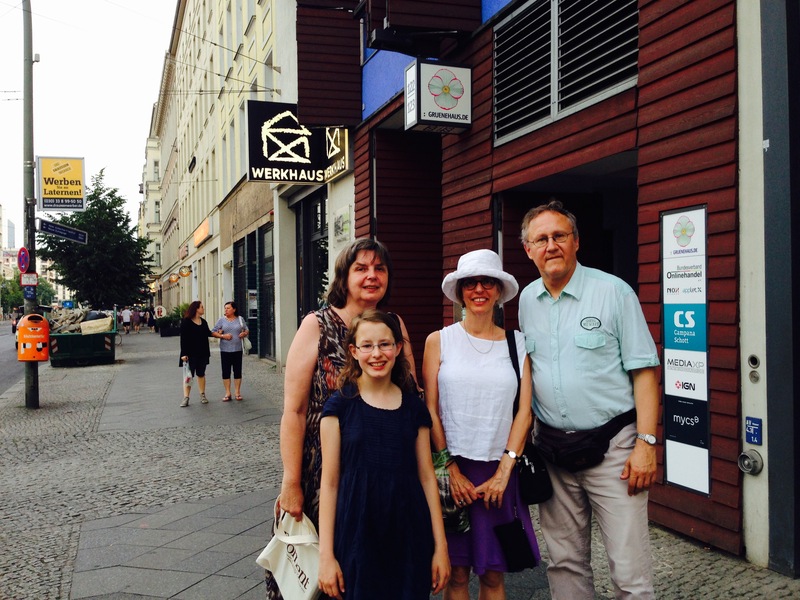 For Christof and Dagmar—and unified Germany—time had progressed normally, but for me it was all new. In fact, the entire time I was in Berlin, it felt like a miracle to be able to cross over the brick lines that mark where the wall once stood. I never got enough of crossing those lines, which wind throughout the city. I couldn’t get over seeing a thriving downtown on what was once the barren land of the Postdamer Platz and Leipziger Platz. I couldn’t get over seeing people walking through and around the Brandenburg Gate. After dinner, I asked Christof and Dagmar to walk with me to where they once lived. It wasn’t terribly far. We strolled through nice neighborhoods with hip shops and cafes and cars from all over world. Borsigstrasse was quiet, but not gray as I remembered. Its apartment buildings had new windows and were painted yellow and other bright colors. It is now in the heart of a vibrant city and country, part of the world again. The seminary and the old apartment building were still riddled with bullets, and the door was locked, so we couldn’t go in. I was amazed to discover that Dagmar had not been back there for 24 years. And their daughter had never been at all. I had walked them back into their past.